Awards & Miniatures – Skylight Studios Inc.
Skylight Studios has designed and fabricated custom awards for schools, corporations, museums, and many other professional organizations. These smaller works are oftentimes used for fundraising and recognition. They can be produced for a one-time event or annually, as we can make a single piece or an edition of hundreds. We offer a wide variety of materials for the finished work and each piece can be personalized with an engraved plaque. Some of the projects below are miniatures of our own works. Others we re-sculpted in a reduced size or produced from a mold of the original. The Gridiron Club recognizes football players, coaches and officials at all levels at its annual events. In addition to the bronze reliefs commemorating Ted Williams, a Boston baseball icon, at the entrances of the tunnel named after him, we also created miniature plaques as trophies and gifts. We sculpted this reduction for Chesterwood, the former home turned museum of sculptor Daniel Chester French. These pieces are often used as awards. Museum of Fine Arts Boston "Appeal to the Great Spirit"
We sculpted this reduction of Cyrus Dallin’s work for the Museum of Fine Arts, Boston. These pieces are often used as awards. We created this small tablet and many copies for Cambridge Public Library in Massachusetts. They were given to donors who supported the restoration of the Library. In addition to the memorial we made in 2007, we also created reductions of the sculpture to be gifted to committee members. The original monumental sculpture is on the grounds of the Massachusetts State House in Boston. The firefighters were designed in a circular composition and are in action and working as a team. In addition to the sculpture we made for Lawrence High School in Lawrence, MA, we created reductions to serve as teacher awards. The sculpture was designed to show teachers’ commitment to students. It is in honor of the work and dedication of all teachers. The New England Patriots Charitable Foundation presents a player annually with the Ron Burton Community Service Award. Ron Burton, who played for the Boston Patriots in the 1960s, is depicted here with two children, symbolizing his work with underprivileged kids. The Patty Kazmaier Memorial Award recognizes annually the most outstanding player in NCAA Division I women’s ice hockey. Kazmaier played ice hockey at Princeton to much success. She passed away at age 28 in 1990. 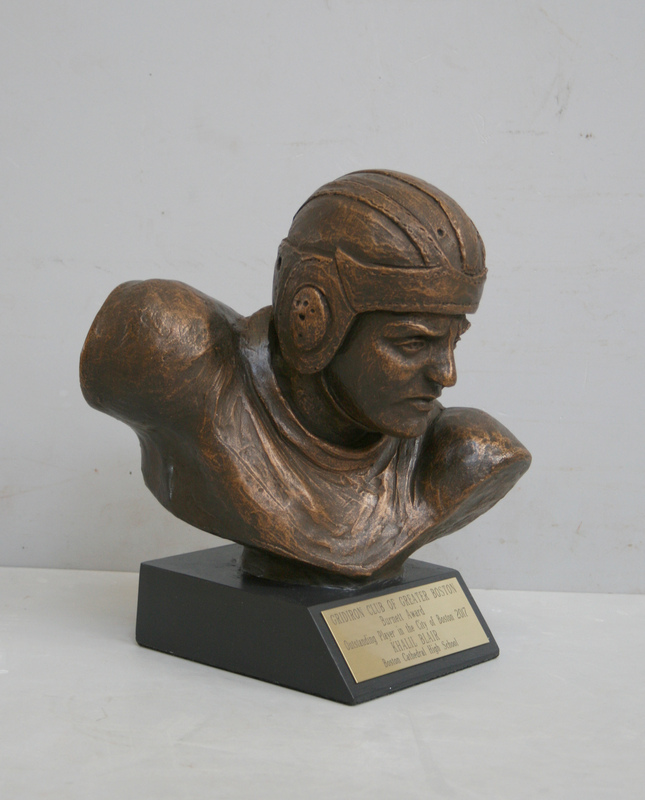 In addition to the sculpture of the goat mascot we made in 2010, we also created reductions of the statue to serve as awards. These original bronzes were designed and created for use by the Symphony as leadership awards. This piece is a miniature model of the original Massachusetts General Hospital building. Reproductions are used by MGH as tokens of appreciation for the service of retiring physicians. The former Cascieri di Biccari, Inc., named for Robert Shure’s two mentors, created a husky statue for Northeastern. Skylight Studios continues to make reproductions of it in all sizes as well as variations of it. Small reproductions, like the one pictured above, are often used as awards by the school. 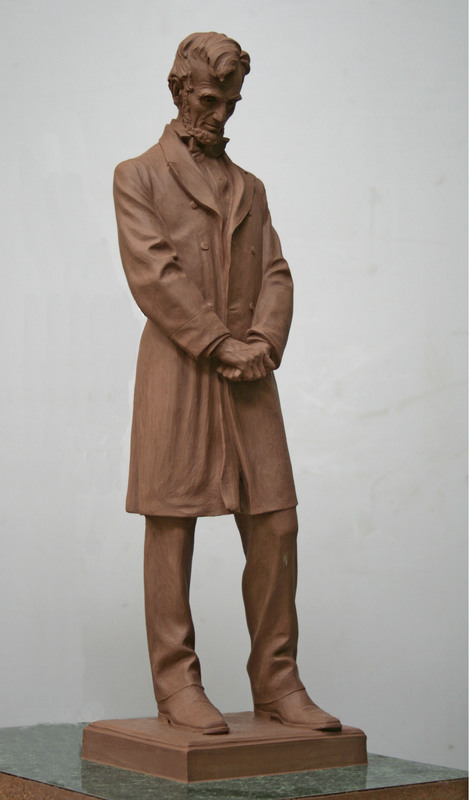 We create reproductions of Harvard’s original miniature of John Harvard by Daniel Chester French so they can be used as awards. The International Institute welcomes immigrants and refugees to New England by aiding them in acclimating to American culture, finding places to live, and securing jobs. The Golden Door Award celebrates the achievements of an immigrant or refugee who has made an impact on other peoples’ lives. Designed to reflect the Brown Palace griffin logo, the Millennium Clock was unveiled on New Year’s Eve, 1999. To mark the occasion, a limited edition of miniatures of the same design were made to be given to guests that night. In addition to the plaque of the legendary Boston Celtics coach installed at North Station near the entryway of the TD Garden, we also created miniature plaques to serve as gifts for the Friends of Red Auerbach. The Boston Police Detectives Benevolent Society presents this award every year to one or two detectives who showed exceptional service. The George Matthews Award recognizes hockey players of Northeastern University. The statue is located at the school.